Albany, NY - August 20, 2015 - Governor Cuomo directed New York State Police to ramp up enforcement efforts as part of a national crackdown on impaired driving. The 20-day campaign, Drive Sober or Get Pulled Over, runs from Aug. 21 to Sept. 7 (Labor Day) and is aimed at significantly reducing deaths and injuries caused by motorists driving drunk or impaired by drugs. The New York State Police, together with the important work of local law enforcement, will be vigilant in screening for impaired drivers. The Governor’s Traffic Safety Committee 2014 annual report found that while the number of alcohol-related crash injuries were down in New York State by nearly 800 over a five-year period starting in 2009, 364 people were killed in such crashes in 2013 and about 30 percent of New York’s crash fatalities are alcohol-related. Additionally, according to the National Highway Traffic Safety Administration, 10,076 people were killed nationwide in crashes involving a driver with a blood-alcohol concentration (BAC) of .08 percent or higher 2013. In New York State, .08 percent BAC is the legal threshold for driving while intoxicated, but many offenders are arrested at nearly twice that level: statewide, the average BAC of those arrested for alcohol-impaired driving is more than .14. Alcohol, however, is just one substance contributing to traffic fatalities. Drugs other than alcohol, such as marijuana and cocaine, are a factor in about 18 percent of motor vehicle driver deaths, the National Highway Traffic Safety Administration says. Even when drunk or impaired driving does not end in death or injury, its effects are particularly costly. The National Highway Traffic Safety Administration estimates that the annual economic cost of alcohol-related motor vehicle traffic crashes in the United States totals $49.8 billion. In June 2015, Governor Cuomo announced that New York State had kept more than 7,500 repeat offenders off the road since implementing tougher DWI regulations in September 2012. Those individuals were denied relicensing either permanently or for an additional five years for having three or more alcohol or drug-related driving offenses on their record. As of July 31, the number has risen to more than 8,000. Also in June, Governor Cuomo announced a statewide multi-media campaign, “Impaired Drivers Take Lives. Think,” using billboards, radio, television and social media to remind motorists about the deadly impacts of impaired driving. As part of the campaign, the Governor's Traffic Safety Committee produced a 30-second public service announcement that can be seen on television and viewed on YouTube. On November 1, 2014, even stronger penalties were enacted in New York to deter impaired driving. Drivers convicted of DWI or DWAI three or more times in 15 years face a Class D felony charge, up to seven years in prison, and a fine up to $10,000. Margaret Ryan, Executive Director of the NYS Association of Chiefs of Police, said, “Drunk driving is no accident nor is it a victimless crime. Each year thousands of lives are lost as a result of motorists operating vehicles while their ability is impaired. That is why the NYS Association of Chiefs of Police and its law enforcement professionals fully support these high visibility enforcement efforts that will deter and remove impaired drivers from our highways and reduce needless fatalities. Along with our partners we will make every effort to ensure all travelers have a safe and enjoyable holiday weekend." New York’s anti-impaired driving enforcement campaigns are funded by the Governor's Traffic Safety Committee and STOP-DWI, a comprehensive and financially self-sustaining highway safety program that allows participating counties to qualify for the return of all fines collected for alcohol and other drug-related traffic offenses. To learn more about the risks of impaired driving and for traffic safety tips, visit the DMV website and the Governor's Traffic Safety Committee website. 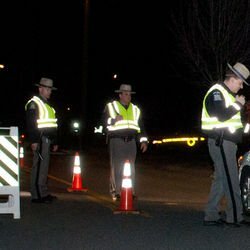 Subject: LongIsland.com - Your Name sent you Article details of "Governor Cuomo Announces End-of-Summer "Drive Sober Or Get Pulled Over" Crackdown on Impaired Driving"